Beauteque has a monthly subscription box that they call the Beauteque Beauty Bag (BB Bag) and it's always got an unusual collection of Asian beauty makeup and skincare products in it. I think this particular month's bag might be my favorite BB Bag since they first started subscriptions in January. They have two subscription offerings right now. 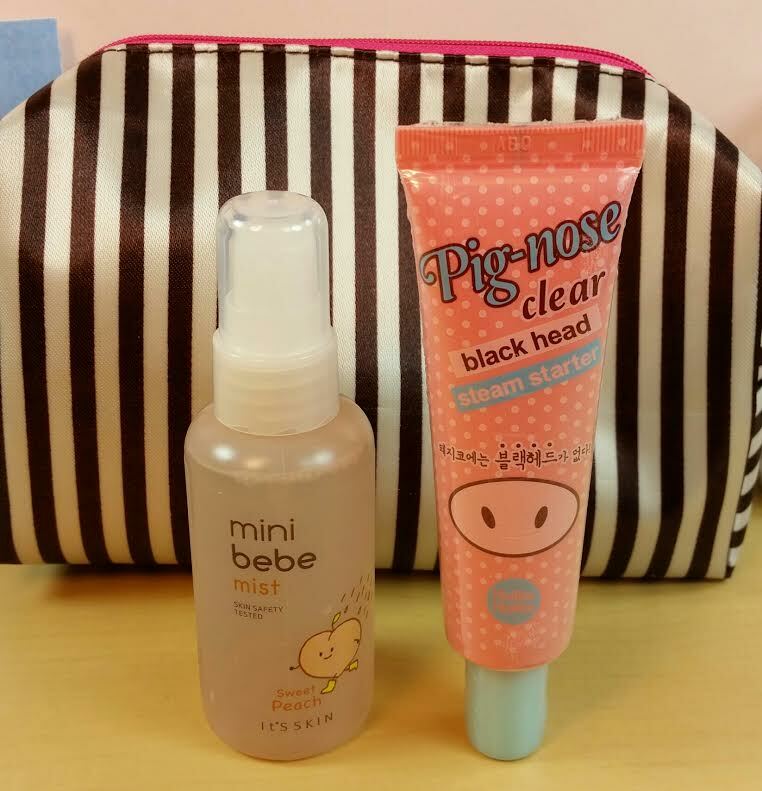 One is this BB bag which I'm reviewing now but the second is Mask Maven and is all about masks. You can read up about Mask Maven here. I love Korean skincare (although not so much the makeup) and Beauteque is a fun way to get it delivered every month. They send not only Korean brands but also Taiwanese and Japanese as well, so there's a pretty wide variety of things that can pop up in a bag. You'll also get a cute little makeup bag to go with everything. The makeup bags are never the same and for the most part they're super useful with pockets and everything. This particular one doesn't have pockets but it's my favorite shape. I like it when they have a bottom that helps them sit up while you're digging around in it. May Island Donkey Milk Skin Mask Pack in Mela-Tox and Wrinkle Filler- Okay. So. I love sheet masks. I think that most people who are into Asian beauty have come to appreciate a good sheet mask. I'm definitely among them. I think they're SO much easier than a wash off or peel off mask and the benefits are better. In my opinion. 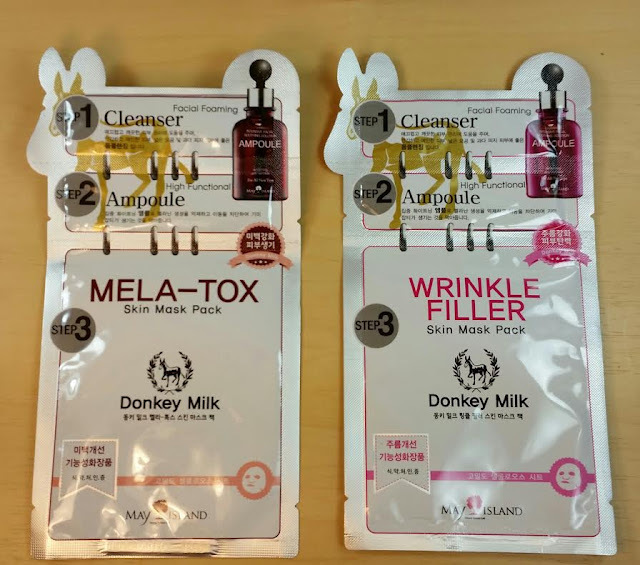 Now, in case you've been unaware of things, donkey milk is like the new "thing" in skincare. Actually, it's not new. It's ancient history- Think Cleopatra bathing in mule milk way back in the day. I have not used anything with donkey milk yet because I somehow managed to dodge all the boxes that contained it. Not on purpose. These two masks are more fun than the average sheet mask because they contain an extra steps! First there is a cleanser. Rub it in and wash it off. Then there is the Ampoule (that's a concentrated serum). Apply it to your face. (There doesn't appear to be ingredients for the ampoule part). Then take out your sheet mask and slap that baby on. The ingredients for both masks I received are stellar. Like actually VERY good ingredients and there actually is donkey milk (although there's not much of it). But who cares about donkey milk at this point because the other main ingredients are good AND effective. The Mela-Tox has a 2% concentration of niacinamide to get rid of your dark spots and then next ingredient is sodium hyaluronate. That means if you want to be moisturized and de-dark spotted, this is the mask for you. Omg, I want more. The Wrinkle Filler one has no niacinamide but that puts sodium hyaluronate further up on the list and that's excellent for plumping up your skin. It's not going to get rid of wrinkles but it will plump it up so some of the finer lines will be eliminated for awhile. How have I not tried these before?! Love! 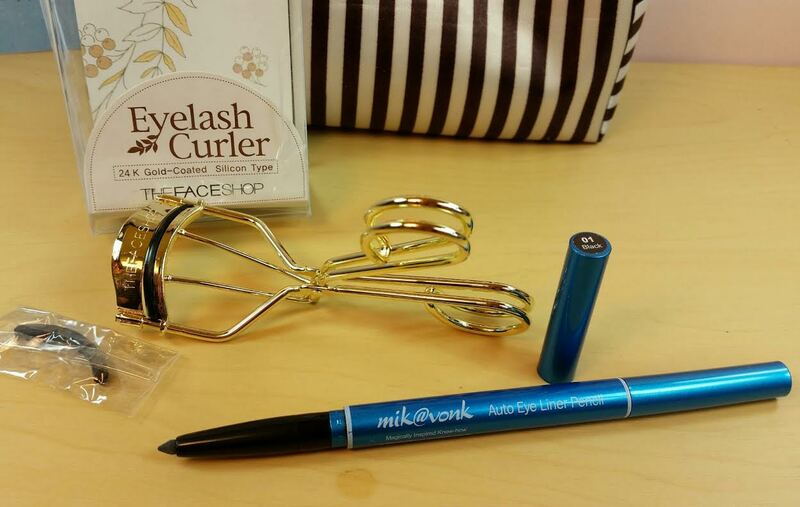 The Face Shop Eyelash Curler- I always need to curl my eyelashes. I have tiny pea eyes (thanks, dad) and I need my lashes to curl up so it looks like they're open. Plus, when I smile, they basically close. Pfft. So, eyelash curlers are necessary. I have one that I already love and use but if it ever breaks, I'll put this one in rotation because it looks sturdily put together. I currently have lash extensions which are basically the best thing ever (except for the expense). Because of that I don't need mascara or curlers since they're already curled and amazing. Mik@vonk Auto liner in Black- Okay, so I'm not a fan of Asian beauty makeup so the fact that this is actually from Australia makes no difference to me. I think I forgot to mention that sometimes Beauteque will sneak in a non Asian beauty item. I don't like it but there it is. They don't claim to only send Asian beauty because they do like to have the option to include items from other places. As long as it's not China, I don't really care. However, I am not impressed with this liner. It's chalky and dry. I would never use it when I have so many better options. If I want to press something hard on my eyeball, trying to get color to show up, I'll choose something less painful. Erg. This is the only flop in the box and it's minor so I'm not counting too much against them. It's Skin Mini Bebe Mist- I love this! It smells SO good. Like actually peachilicious without any aftertaste... Er, aftersmell? Unfortunately, (and this seems to be a recurring problem) I had requested the Shining Apple version and I got the Peach. I don't care since Peach smells great but while I love the fact that Beauteque gives an opportunity to make a choice, it doesn't mean much if you don't follow through with that. So far this is twice that I have not received what I requested. This product is a moisturizing mist. You can mist it on your face and body. It has water, glycerin, soymilk (?! ), and then a whole bunch of fruit extracts for antioxidant value. Nothing bad so I'm totally using this. Not to mention that it smells so good. Holika Holika Pig Nose Clear Blackhead Steam Starter- This gel is supposed to help open your pores while emptying them out at the same time. It's got kaolin and Morroccon pink clays in it. You massage it for three minutes and then rinse it off. If only I hadn't just used my super awesome Purederm Cocoa Nose Packs I would have some blackheads to try this on. Did I just wish my pores would get dirty so I could use a new product? Uh, yes, I think I just did. Nature Republic Bulgarian Rose Essence- This is an essence which means it comes after your toner in your Asian beauty routine. Cleanser, toner, essence, serum, ampoule, eye cream, light moisturizer, heavier moisturizer/BB cream or sunscreen is how I do it. Sadly, this isn't made with rosehip oil, which is packed with the antioxidant Vitamin C but it's made with rosa damascena flower oil. The first few ingredients are water, glycerin, dipropylene glycol, denatured alcohol, glycereth-26 and sodium hyaluronate. I don't like to see alcohol in the skincare but the benefits of glycerin and sodium hyaluronate may overcome that. Glycerin is an excellent (and yes, cheap) moisturizer and sodium hyaluronate is the deepest penetrating form of hyaluronic acid. Which means your skin is moisturized way deep down. Yep, that's always good. Nature Republic by Flower Vivid Tint Bar- I got Strawberry (and that's what I requested!) and it's a hot pink. It's definitely tinted but it's not glaring or awful. It's got SPF which is key right now. I've sort of migrated my non SPF tints to the back of my drawer because it's been really sunny out and I've been gardening like a madwoman. This is a nice lip balm, not sticky, a pretty color and a cute package. If the curation and products continue to be this awesome, I think it's really going to help perk up the Beauteque BB Bags. It's not that they've ever been bad but just not too exciting. This one, however, made me happy the second I opened it up. If you'd like to subscribe to the Beauteque Monthly BB Bag, you can do that right here! They do ship internationally but I'm not sure of the prices that go along with it. If you're in the US, it's $3.95 so your bag will be just under $30. The bags are usually worth more than double the purchase price which is nice. Plus these aren't peasly samples, these are full size products. It's late and I think this review might have come out kinda crazy... Hopefully, all my points got across. Haha! 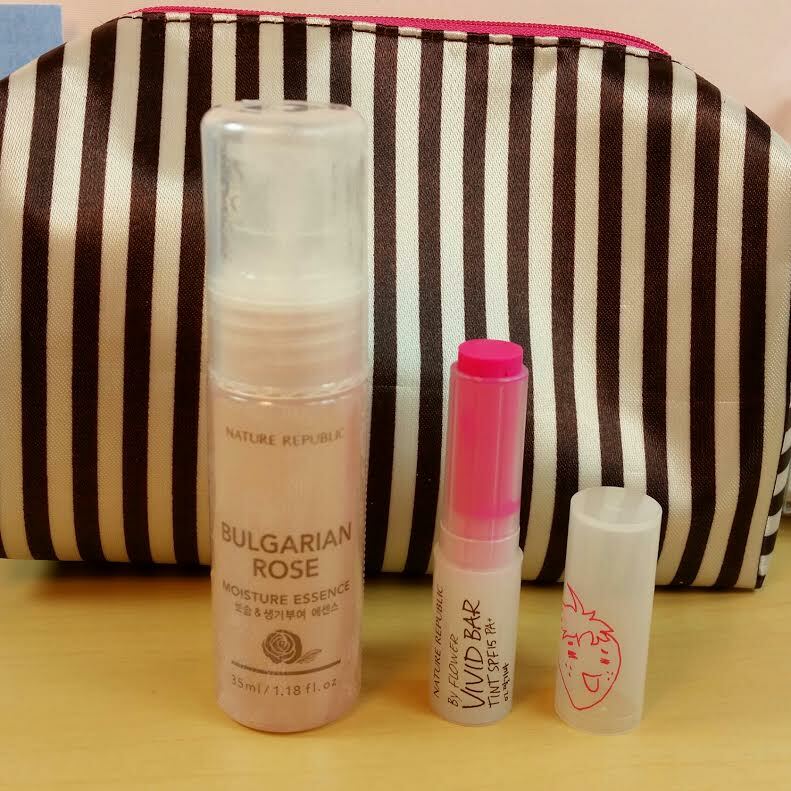 Basically, kbeauty is awesome and this bag rocked, you should totally get the next one! *This bag was sent to me for review purposes. No compensation was received. All opinions are ridiculously mine. Affiliate links were used in this post. I should get some sleep. Do you seriously have that many steps in your skincare routine? Everyday? Twice a day?? I haven't even heard of essences and ampoules! Yes, you can totally buy things separately. Beauteque has a website (www.beauteque.com) where you can find some things but their BB bag tends to have things they don't carry. They don't have the masks but I see them on Ebay and then here's a link to RoseRoseShop (http://www.roseroseshop.com/it/50-sale/1670005--may-island-donkey-milk-skin-mask-pack-1pack-10pcs-noaqua.html). It's not exactly the same one but you can probably fiddle around on the internet and find the exact ones. They're cheaper buying from Korea but shipping can be killer and make Ebay prices more attractive. Other than that, I've also had good experiences with testerkorea.com and many have used BeautyNetKorea with no issues. Yes, I have that many! More actually since I do it a little differently at night. Of course sometimes, I am lazy and do absolutely nothing. But if you haven't heard of essences and ampoules, you are missing out!! Serums, essences and ampoules are my favorite part because they're light but concentrated moisturizers with added benefits like whitening or extra antioxidants, or antiseptic properties and so on. My favorite essence ever, if you want to try something affordable and easy to add into your routine (if you have one- if you don't just get this and use only this) is the Benton Snail Bee High Content Essence. You can get it on Amazon for.... $15 (http://www.amazon.com/Benton-Snail-High-Content-Essence/dp/B00EC60MYW/ref=sr_1_1?ie=UTF8&qid=1431492036&sr=8-1&keywords=benton+snail+bee+essence)! I love it! It is a Korean brand but it's good for all skin types, is a clear gel that's super moisturizing and just makes my skin look glowy and awesome. I'm definitely going to try that essence, thank you! I've never gotten a tracking email BUT I've signed up for USPS MyChoice (or whatever it's called) so anything sent USPS to my address pops up in my account. So I usually know when mine will get here. If it makes you feel better, I'm pretty sure I get mine earlier than everyone else because I'm an "Ambassador". I'm supposed to talk everyone into buying them but half the time it feels like I'm talking people out of it, haha! I mean... I'm not too shy about what I hate. Except this bag was actually really good and I loved it. If you're missing TWO months of BB bags (Is that March and April?!)... That isn't good at all. Email them again or something. I'm sure they'll fix it for you but it's still a nuisance to have to deal with. Bahaha, the Tony Moly bag... Don't get me started. I really liked this bag, too! The liner was the only thing I really disliked. I agree it was chalky and dry. The double ends weren't any different from each other either- it looks like one is supposed to be glittery but they look exactly the same when I swatch it. I won't use the essence either because it's Rose, but I'm sure I can find someone who will enjoy it! Haha! I probably should have mentioned the double ends but I hated it so much that I didn't even bother trying the opposite side. Rose is a very polarizing fragrance. I think it's hard to do well. I don't mind rose scent if it's subtle and smells real. But I have serious flashback issues with certain rose scents to back in the early 90's when Tea Rose was the popular scent in high school. I get this bag. My eyeliner was white, which was great for me because I typically use a white as a highlighter. I'm ok with the occasional non-Asian product in the bag if it's not American since that means I likely wouldn't have had access to it anyway. If I have any complaint about their bags it's if I really like a product, they don't usually stock it so I can't buy it from them and have to go hunt it down. I LOVED the May Island Donkey Milk mask pack. All I could think is keeping 5 of these on hand for travel. They would easily fit in a quart ziplock and I could put it in my carry on. I also liked the mask because it was the traditional cotton (or cotton-like) so it really can be smoothed on your face unlike the masks that have a plastic outer layer that I can never get to sit right. But yeah, that donkey milk mask is sticky. I let it sit for maybe 15-20 min and then had to rub the excess in and let it dry at least 10 min more before I could use any other products/make up. RoseRose has them and I'll be getting some to have ready for weekend trips etc.